Without protection, the sun can be an evil intruder. It can unmercifully fade and shorten the lifespan of some of your most valuable furnishings, hardwood floors, carpets, drapes and leather sofas. All are vulnerable to this powerful aggressor. Our high-tech window films can effectively protect your home's furnishings as well as provide increased comfort/privacy for you and your family. 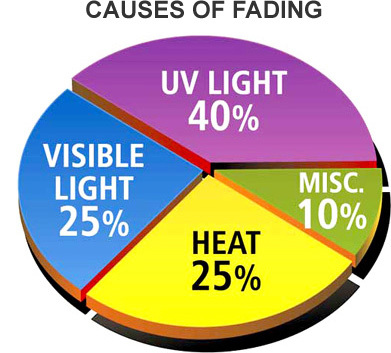 By blocking out 99 percent of the sun's harmful UV rays, window film attacks the primary culprit of interior fading. It can also cut down on annoying glare without visually affecting your view. As many commercial building owners already know, window film reduces the amount of solar heat penetration, resulting in a more comfortable living environment. If your air conditioning doesn’t run as much, then you are saving money on every sunny day! We carry several different brands of film to choose from (see below) to suit the needs of your home. Our brands come with a lifetime limited warranty that covers against cracking, peeling, bubbling, delamination or de-metalization.